Objective To explore the basis for patient complaints about the oldness of most magazines in practice waiting rooms. Setting Waiting room of a general practice in Auckland, New Zealand. Participants 87 magazines stacked into three mixed piles and placed in the waiting room: this included non-gossipy magazines (Time magazine, the Economist, Australian Women’s Weekly, National Geographic, BBC History) and gossipy ones (not identified for fear of litigation). Gossipy was defined as having five or more photographs of celebrities on the front cover and most gossipy as having up to 10 such images. Interventions The magazines were marked with a unique number on the back cover, placed in three piles in the waiting room, and monitored twice weekly. Main outcome measures Disappearance of magazines less than 2 months old versus magazines 3-12 months old, the overall rate of loss of magazines, and the rate of loss of gossipy versus non-gossipy magazines. Results 47 of the 82 magazines with a visible date on the front cover were aged less than 2 months. 28 of these 47 (60%) magazines and 10 of the 35 (29%) older magazines disappeared (P=0.002). After 31 days, 41 of the 87 (47%, 95% confidence interval 37% to 58%) magazines had disappeared. None of the 19 non-gossipy magazines (the Economist and Time magazine) had disappeared compared with 26 of the 27 (96%) gossipy magazines (P<0.001). All 15 of the most gossipy magazines and all 19 of the non-gossipy magazines had disappeared by 31 days. The study was terminated at this point. Conclusions General practice waiting rooms contain mainly old magazines. This phenomenon relates to the disappearance of the magazines rather than to the supply of old ones. Gossipy magazines were more likely to disappear than non-gossipy ones. On the grounds of cost we advise practices to supply old copies of non-gossipy magazines. A waiting room science curriculum is urgently needed. The first author (BA) has fielded many complaints about the lack of up to date magazines in the waiting room of his general practice. The reason for this phenonemon was clearly a burning research question, given the number of times that patients had complained. We searched Medline, Google Scholar, and grey literature for studies on missing magazines and on waiting rooms, but despite finding information on the design of waiting rooms, satisfaction with service based on the waiting room experience, and other waiting room related topics, there was nothing on the disappearance of magazines. Evidence for the absence of up to date magazines was lacking and many of the articles that did mention magazines in waiting rooms said they were mainly old,1 2 consistent with our experience. Quantification of this phenomenon was urgently needed. We hypothesised that either practice staff put out only old magazines or that they put out reasonably recent ones and these disappeared. We determined the age (most current or older) of those magazines that disappeared from the waiting room first and then quantified the rate of loss of the magazines. As we had also noted that the non-gossipy magazines such as the Economist and Time magazine were usually present and the gossipy ones less likely to be present, we tested the hypothesis that gossipy magazines would disappear more quickly than the non-gossipy ones. We carried out a cohort study, with the “participants” being the magazines placed in the waiting room of a general practice in Auckland, New Zealand. The sample size was determined by how many magazines the investigators could rustle up from family and friends. We also purchased some gossipy magazines related to nature and urban life. Ethical advice proffered by the partner of one of the investigators advised against using any “gossipy” magazine on the grounds that they were distasteful and possibly harmful to people. If we had accepted that advice then the study would have been terminated immediately. The methods advice design team (MADT) (our four receptionists) believed that the study needed a spectrum of magazines from which to derive a valid estimate of the loss, therefore we included gossipy magazines. We defined a gossipy magazine as one that had five or more photographs of celebrities on the front cover and a most gossipy magazine as one that had up to 10 such images. The Economist and Time magazine were deemed to be non-gossipy. The rest of the magazines did not meet the gossipy threshold as they specialised in, for example, health, the outdoors, the home, and fashion. Practice staff placed 87 magazines in three piles in the waiting room and removed non-study magazines. To blind potential human vectors to the study, BA marked a unique number on the back cover of each magazine. Twice a week the principal investigator arrived at work 30 minutes early to record missing magazines. The primary outcome was a comparison of the disappearance of the more current magazines with the older magazines. Secondary outcomes were the rate at which the magazines disappeared and the rate of loss of gossipy magazines compared with non-gossipy magazines. We terminated the study when there were no more of either the 15 most gossipy magazines (not identified by name owing to fear of litigation) or the 19 non-gossipy magazines (the Economist and Time magazine). For purely compassionate reasons (fear of a waiting room riot), MADT insisted that the study should be terminated before all the gossipy magazines had disappeared. The clinic staff were asked to leave the magazines alone, and any failure to comply could result in the “death penalty” (actual words used). This warning was given to ensure that everybody understood the serious nature of the study. If the death penalty had been invoked we would have sought retrospective approval by an ethics committee (and New Zealand judicial advice). We made no attempt to randomise the magazines but had them shuffled, as was normal practice in the waiting room. We analysed the results using SAS software. A Cox proportional hazard model was used to model survival time probabilities. Covariates for this model included age of the magazine and gossipy magazines (gossipy and most gossipy magazines combined). Logistic regression was used to check survival of the gossipy and non-gossipy magazines over the survey period. On 28 April 2014, staff of a South Auckland general practice placed 87 magazines in three piles in the waiting room. The study was terminated after 31 days when all 15 of the most gossipy magazines and all 19 of the non-gossipy magazines had disappeared. Eighty two of the magazines had a date on the front cover and were aged less than 1 year (some were the autumn issue for which we assigned an approximate date, five had no date). Forty seven magazines were aged less than 2 months and 28 (60%) had disappeared at the end of the study. Ten of the remaining 35 older magazines (29%) had also disappeared (P=0.002). After 31 days, 41 of the original 87 magazines (47%, 95% confidence interval 37% to 58%) had disappeared. Using the hazard ratio, on any one day the gossipy magazines disappeared 14.51 times (95% confidence interval 6.69 to 33.32) faster than the non-gossipy ones (figure⇓). At termination of the study, 41 of the 87 (47%, 95% confidence interval 37% to 58%) magazines were missing, equating to a disappearance rate of 1.32 magazines each day. Of the 19 non-gossipy magazines (four Time magazines and 15 of the Economist), none had disappeared. Of the 27 gossipy magazines, only one was left. This difference was significant (P<0.001). Magazines that disappeared were also significantly cheaper than those that remained. The table⇓ shows the “demographics” of the participants. The figure shows the Cox proportional hazard model with age of the magazine included as a covariate, the mortality or disappearance rate of gossipy magazines (gossipy and most gossipy magazines combined) was significantly higher (P<0.001). Gossipy magazines were over 14 times more likely to disappear at any time than non-gossipy magazines. 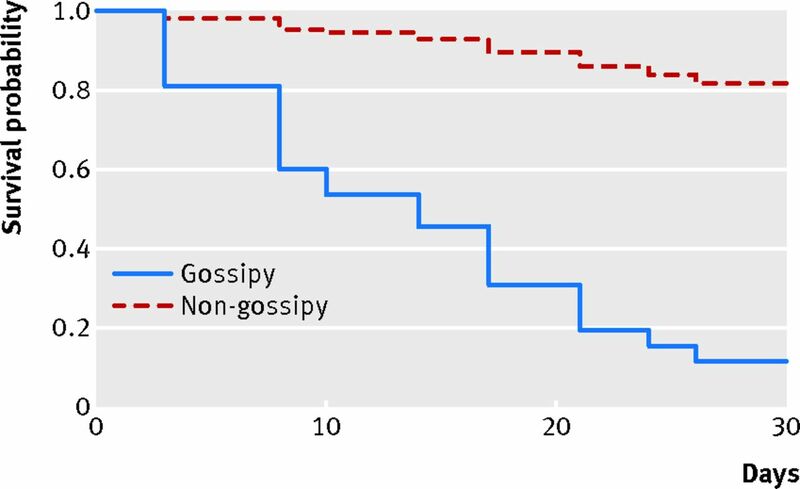 Gossipy magazines had a significantly higher mortality rate than the non-gossipy ones (P<0.001), whereas age had no significant impact on survival (P=0.41). The oldest gossipy magazines disappeared and the newest issues of the Economist and Time magazine remained. Almost half (47%) of 87 magazines left in a general practice waiting room in Auckland, New Zealand, had disappeared after 31 days, and current magazines were more likely to go missing than older ones. Gossipy magazines, defined as having five or more photographs of celebrities on the front cover, were most likely to disappear. This study is possibly the first to explain the lack of up to date magazines in doctors’ waiting rooms and to quantify the loss of magazines. Another first was the discovery that gossipy magazines were more likely to disappear than non-gossipy ones (the Economist and Time magazine). The investigators had raised the possibility of having only the non-gossipy magazines in the waiting room to see if they would disappear under similar circumstances. This was immediately vetoed by the methods advice design team (MADT) (our four receptionists), although one team member said we were welcome to conduct this arm of the study provided she was on holiday at the time. The views of MADT trumped the plans of the investigators. The study practice had 5164 registered patients, smaller than the 7000 in the average UK practice. The New Zealand practice has a younger population, with 39% of patients aged from birth to 24 years and 13% aged more than 65 years. The socioeconomic status of the patients is evenly spread. The waiting room holds about 20 adults, and during the study approximately 3000 patients used the area. If we extrapolate our findings of 41 magazines each month at an average cost of £3.20 ($5.00; €4.00) per magazine over the 8000 practices in the United Kingdom, this equates to £12.6m disappearing from general practices, resources that could be better used for healthcare. Practices should consider using old copies of the Economist and Time magazine as a first step towards saving costs. One limitation of this study is that it was conducted in a single clinic. Other limitations include the small convenience sample of “participants,” the unconventional definition of magazine type, and the short subjective study period. However, our own experience with practice waiting rooms and that of Boyle’s suggests this is a universal phenomenon. We welcome a multinational collaboration to determine the generalisability of our results. Our literature search found articles dedicated to the design of waiting rooms to moderate pain,4 anxiety,5 stress,6 respiratory health,7 and quality of care.8 Some studies described the experience of waiting.9 10 Many studies wondered what else could be accomplished while patients waited for care.11 12 13 14 15 No studies were related to the disappearance of magazines. We discovered that the waiting room has its own hashtag on twitter #waitingroom, with 140 character stories and pictures of adventures (or non-adventures) in all types of waiting rooms. We feel the existence of this hashtag bodes well for the future of waiting room science and we believe that it will not be long before students are tweeting excitedly about their latest courses #waitingroomscience. Future research in waiting room science would include identifying who or what is responsible for the removal of magazines. This could involve a yet to be developed “find my magazine” smart phone application. Another follow-on study should be conducted to examine the effects on receptionists in a waiting room without gossipy magazines. Unfortunately we are not familiar with any clinic willing to participate in that research. We thank MADT (Kasey Dawson, Rixanne Fergusson, Florence Iosefa, and Tes Williams) for their advice on how to run this study. No gossipy magazines were harmed in this study (although we were tempted). Some recipe pages were torn out. Please be assured that clinical staff did not remove magazines during this study, so none incurred the death penalty. Contributors: All authors read drafts of the document and the final version. BA came up with the idea and the design. SA conducted the literature search. SM did the statistical analysis. BA is the guarantor. Funding: This study received no funding. Competing interests: All authors have completed the ICMJE uniform disclosure form at www.icmje.org/coi_disclosure.pdf (available on request from the corresponding author) and declare: BA has a subscription to the Economist and is hoping for a free lifetime subscription when this article is published. The authors have no vested interest in the Economist or in Time magazine. SA reads gossipy magazines in grocery checkout lines for research purposes only. We have had no support from any organisation for the submitted work; no financial relationships with any organisations that might have an interest in the submitted work in the previous three years, no other relationships or activities that could appear to have influenced the submitted work. Transparency: The lead author (BA) affirms that this manuscript is an honest, accurate, and transparent account of the study being reported; that no important aspects of the study have been omitted; and that any discrepancies from the study as planned (and, if relevant, registered) have been explained. Deitrick L, Ray D, Stern G, Fuhrman C, Masiado T, Yaich SL, et al. Evaluation and recommendations from a study of a critical-care waiting room. J Healthc Qual 2005;27:17-25. Donnelly L. Dentists told old magazines are a health and safety risk. Telegraph, 2012 Oct 21. www.telegraph.co.uk/health/healthnews/. Boyle H. Old magazines in waiting rooms. Ocala-Star Banner; 1970 Feb 27. http://news.google.com/newspapers?nid=1356&dat=19700227&id=v5VPAAAAIBAJ&sjid=SgUEAAAAIBAJ&pg=5186,8976842. De Tommaso M, Ricci K, Laneve L, Savino N, Antonaci V, Livrea P. Virtual visual effect of hospital waiting room on pain modulation in healthy subjects and patients with chronic migraine. Pain Res Treat2013;515730. Fenko A, Loock C. The influence of ambient scent and music on patients’ anxiety in a waiting room of a plastic surgeon. HERD2013;7:38-59. Beukeboom CJ, Langeveld D, Tanja-Dijkstra K. Stress-reducing effects of real and artificial nature in a hospital waiting room. J Altern Complement Med2012;18:329-33. Macher JM, Alevantis LE, Chang YL, Liu, KS. Effect of ultraviolet germicidal lamps on airborne microorganisms in an outpatient waiting room. Appl Occup Environ Hyg 1992;7:505-13. Arneill AB, Devlin AS. Perceived quality of care: the influence of the waiting room environment. J Environ Psychol 2002;22:345-60. Kutash M, Northrop L. Family members’ experiences of the intensive care unit waiting room. J Adv Nurs 2007;60:384-8. Bournes DA, Mitchell GJ. Waiting: the experience of persons in a critical care waiting room. Res Nurs Health2002;25:58-67. Ward K, Hawthorne K. Do patients read health promotion posters in the waiting room? A study in one general practice. Br J Gen Pract1994;44:583-5. Wicke DM, Lorge RE, Coppin RJ, Jones KS. The effectiveness of waiting room notice-boards as a vehicle for health education. Fam Pract 1994;11:292-5. Montazeri A, Sajadian A. Do women read poster displays on breast cancer in waiting rooms? J Public Health2004;26:355-8. Li VC, Coates TJ, Spielberg LA, Ewart CK, Dorfman S, Huster WJ. Smoking cessation with young women in public family planning clinics: the impact of physician messages and waiting room media. Prev Med1984;13:477-89. Tansik DA, Routhieaux R. Customer stress-relaxation: the impact of music in a hospital waiting room. Int J Serv Ind Manag1999;10:68-81.